As part of the Kenley Revival Project we delved a little deeper into RAF Kenley`s fascinating history and revealed the secrets of its past. Between 17 and 23 of July we were supported by 25 volunteers who took part in our Community Archaeology Dig 2017. This year we focused on investigating the area around the blast pen at the end of Golf Road. With the help of old aerial photographs and in cooperation with Historic England and professional archaeologists we had an idea of where we needed to look for features. 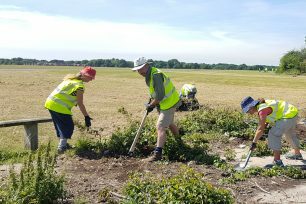 The volunteers were really keen to get involved and worked very hard throughout the week digging and scraping all to peel back the layers of RAF Kenley’s history. 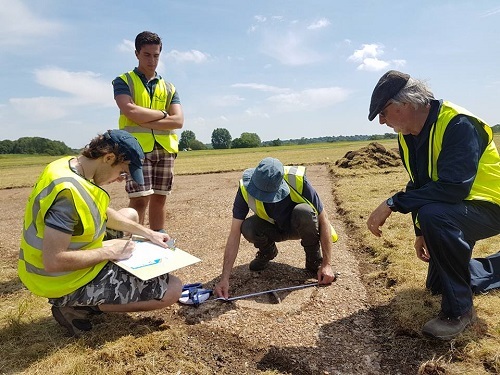 We concentrated on six different features and were supported by four professional archaeologists throughout the week, some of whom you might recognise from Time Team! The focus of our efforts was on the blast pen near the end of Golf Road otherwise known as KC29 and the surrounding areas. 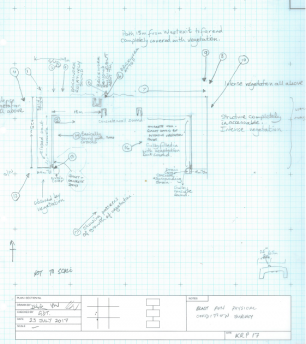 We were particularly interested in this area because the historic maps revealed this was a real hive of activity with many structures in addition to the well recognised blast pen which remains today. A blast pen is a specially constructed e-shaped double bay for accommodating aircraft against bomb blasts during enemy air-attacks. The blast pen near the end of Golf Road which was part of the archaeology area is missing its spine wall as it was demolished in the late 1980s. 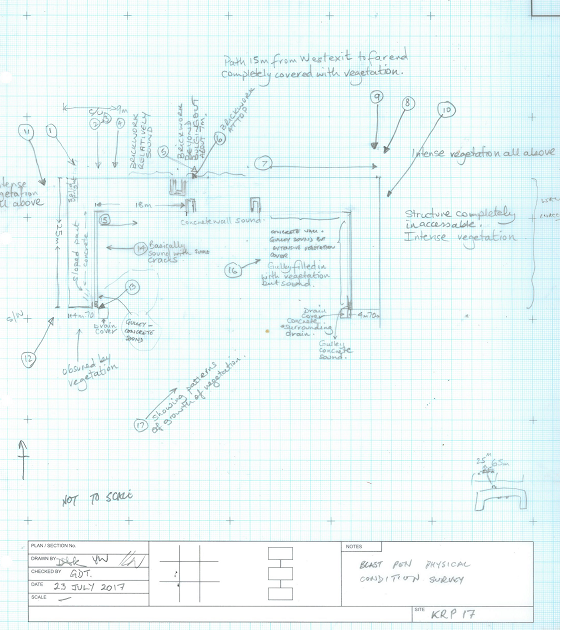 The volunteers recorded the blast pen in its present appearance and they were required to be very accurate in order to draw a detailed plan which will help us to understand more about the architecture of the blast pen. We are also busy conserving this pen and wanted to capture its detail in its original state. There are several concrete triangles around the airfield which are hidden under a thick moss layer. We unearthed one of the concrete triangles including several metal hooks. We are not completely sure what their purpose might have been but the team had a long discussion and we came to the conclusion that they might have been used to tie-down airplanes. This would have helped during refuelling whereby you would want to refuel your plane away from the blast pen as they were quite prone to setting on fire. Also quite remarkably it only takes 15 seconds to refuel a spitfire! On the corner just behind the noticeboard we have uncovered another tarmac area. It has a hexagon shape and we found the same tie-down hooks but there was no evidence of the distinct triangle shape. The tie down hooks roughly measure the wingspan of a spitfire apart so again lending to the theory they would have been used for this purpose, there is also a central hook which we think may have had a dual purpose; to tie down the plane but also act as an earthing rod should the plane be hit by lightning when parked. After uncovering this area we went back to the triangle and put a trench on one side and found the same tarmac from the hexagon. This would suggest that the concrete triangle was put over tarmac at a later date or as was often the case, the concrete would have been more expensive so the decision was made to only concrete one of these areas to save on cost. The shape of these is also significant with the distinct triangle shape being visible from the air so pilots would know where to park their planes. When RAF Kenley was at its peak operational use with three squadrons there would have been 54 planes dotted around the airfield. The blast pens in total would have fitted 24 so the other 30 needed to go somewhere! For defending RAF Kenley there was the unconventional parachute-and-cable system in position along the northern side of the airfield just outside the perimeter track with launchers at 60-foot intervals. This device comprised of a 480-foot length steel cable which was carried 600 feet high by a rocket. At the top of the trajectory the cable would release a parachute and suspended the cable hopefully in the path of the enemy aircraft. We know the system was used for the first time on the 18 August 1940 where it is known to have brought down one aircraft; effectively acting as a net that the enemy aircraft would have got tangled up in. However upon further research we think that its main purpose was not so planes would get tangled but rather act as a means of confusing pilots. The idea being if you were flying at low altitude ready to strike a target and a giant cable springs up into the air ahead of you, you would instinctively fly upwards and therefore be more likely to miss your target. Overall the parachute-and-cable system remains a bit of a mystery and it is often thought that Winston Churchill himself championed the idea due to his fondness of RAF Kenley. Unfortunately we couldn’t find any evidence of the parachute-and-cable system so far but we will keep trying! The volunteers cleared the footings of the dispersal hut where pilots would spend time before flying. According to research this was actually the site of the Canadian flight hut which shows the international diversity of RAF Kenley during the war. We had some great finds close to the flight hut such as little metal plates which had hand drilled holes and hand written etchings. These would suggest they were tokens which were kept in the doorway of the hut perhaps to remind the pilots of their missions and as a means of competing against each other! The volunteers also found a leather purse with a few coins which dates back to the 1950s along with a cigar case. We found two concrete circles just a short distance behind the dispersal hut. We have excavated these around the edges but didn’t manage to dig down to the bottom as the material used to fill this in being mainly of broken up tarmac and industrial waste which was quite laborious to clear. The best thing about these two circles is that it shows real archaeology in action with our two lead archaeologists spending many hours debating as to the purpose of these rings. One theory that they would have been anti-aircraft gun emplacements. The other given the rather convenient distance from the flight hut is that it could have been the site of the toilet! In either case we will excavate these further next year so whatever we may find we are sure it will prove the theory either way! Many thanks to Cat and Dave from MOLA for leading our team of volunteer archaeologists and Guy, Odette and Jan for supervising our volunteers. And thanks to Neil as our Kenley Airfield Friends Group Archaeology Champion! Overall we had a highly enjoyable week despite what was every type of typical British weather we could experience. Now begins the work of cleaning and cataloguing the finds which will go on our online archive in due course. 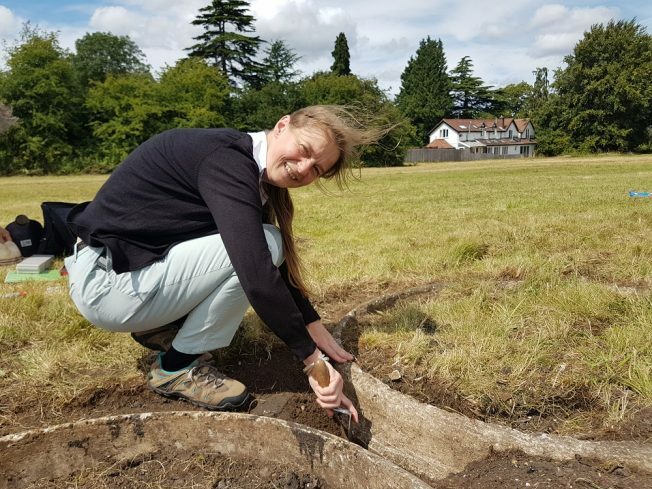 If you would like to find out more about what we uncovered please do join us at our Sky Heroes event on 10 September where Jane Sidell from Historic England will be providing tours of the dig. Please be aware that Kenley Common is part of an Scheduled Ancient Monument which is protected by law. It is illegal to undertake metal detecting on this site and any such activity is a criminal offence. We will organise another Community Archaeology Dig in 2018. 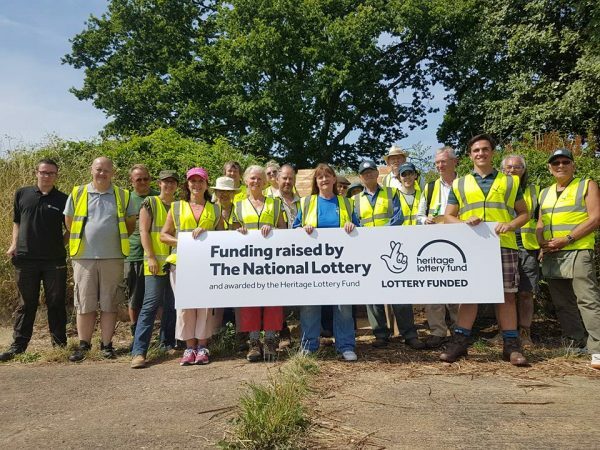 To find out how you can join as a volunteer and hear more about the project please sign up to our newsletter.